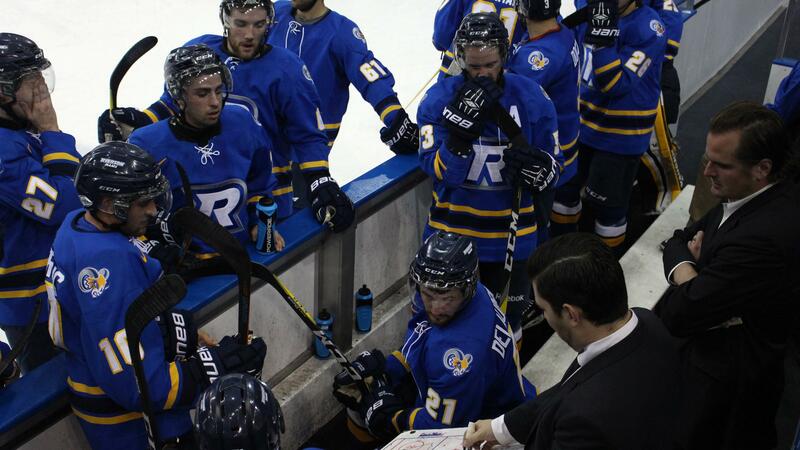 Michael Fine has seen his fair share of players and rosters come and go in four seasons with Ryerson’s men’s hockey team, each one special in their own way. This year, he sees something in his team that wasn’t there before. “The biggest difference for myself, being on this team compared to other teams … is that we’re never out of it and we never feel out of it,” said the centre and team captain, now in his fifth and final season as a Ram. “We know that if everybody’s going hard and playing for each other … we’re never out of a game, we’re just one shot away, one shot at a time, whether we’re up or down, we just keep going. 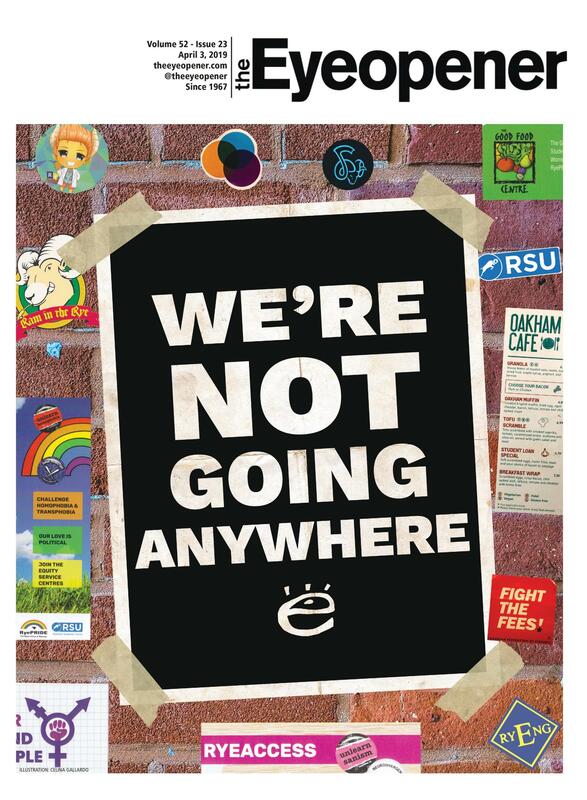 “We have a lot of confidence.” And why shouldn’t they? After winning the first two Ontario University Athletics (OUA) championships in Ryerson history last year, much of the school community has been understandably focused on the men’s and women’s basketball teams. With both squads returning to the Mattamy Athletic Centre in glorious fashion, winning their home openers on Nov. 18 before Ryerson unveiled its first OUA championship banners the following evening, the hype has seemed justified. 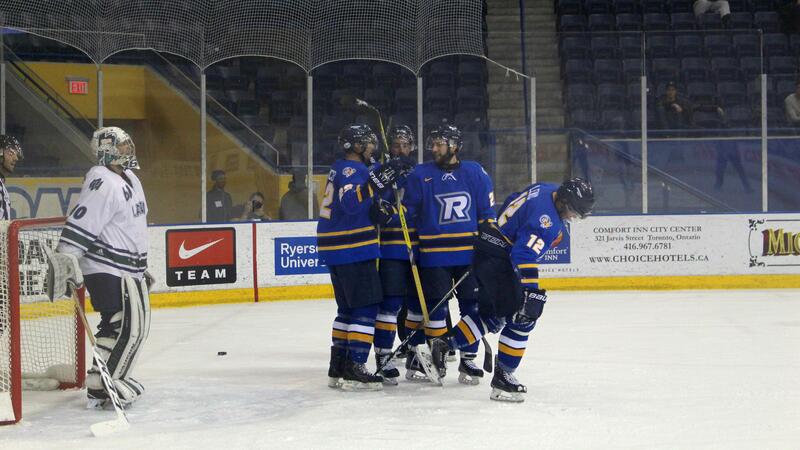 But while the early-season success of Ryerson’s title-winning teams has been captivating Rams fans, the men’s hockey team is quietly having the best start to an OUA season in program history. Heading into their Nov. 23 matchup with the University of Toronto, which will mark the halfway point of the team’s 28-game regular season, Ryerson is 10-2-1 through its first 13 contests. When Ryerson went 17-11-0 for its best-ever regular-season record in 2013- 2014, the Rams were 9-4-0 through their first 13 games. The team sits first in the OUA West division and is tied with McGill (10-2-1) for the best record in the OUA. 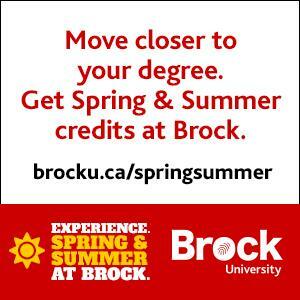 Ryerson’s strong start is also garnering some national attention. The University of New Brunswick (UNB) is the only team in Canada that has won a larger percentage of its games so far, and the Rams have been a top-10 nationally ranked squad for seven straight weeks—a first for the program. For Fine, the key to Ryerson’s first-half success has been obvious: roster depth. “I’ve been on a couple of teams at Ryerson where if the top line wasn’t scoring, there was a good chance we weren’t going to win the game,” he said. “It’s a good thing when you can get four lines going because the other team doesn’t have to key in on one or two lines; they have four lines that they have to worry about and we have four lines that can bring it.” Of the 24 skaters to play for the Rams so far this season, 19 have scored at least one goal, and 14 have scored two or more. Despite being one of the five skaters without a goal, second-year defender Brandon Devlin sits fourth in total points on the team with 11 assists. Scoring by committee has given Ryerson one of the most potent offences in the country. Averaging nearly four-and-a-half goals per game, they’re tied with McGill for second place in Canada in that category, behind UNB. It’s been an impressive first half of the season for the team, but according to interim head coach Johnny Duco, the results haven’t been especially surprising. Duco spent three seasons as an assistant and associate coach before being named the interim head coach when Graham Wise retired after 10 seasons behind the Rams bench. When Duco took over, he aimed to implement a faster, more up-tempo style of hockey than that of past Ryerson teams, with an emphasis on puck possession and a well-balanced offence. It’s the same formula that the NHL’s Pittsburgh Penguins employed last season when they won the franchise’s fourth Stanley Cup, and Duco believes it’s hockey’s best recipe for future success. But a balanced offence requires the right combination of players, something that the Rams have been especially focused on over the past two off-seasons. 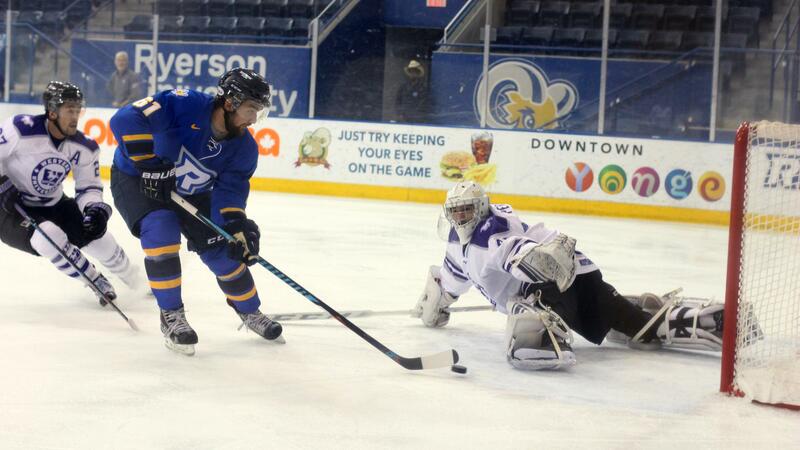 Including goaltender Brodie Barrick and defenders Daniel Poliziani and Josh Chapman, all of whom have yet to play a game this season, 21 of Ryerson’s 29 rostered players joined the Rams after the 2014-2015 season. Of those 21 players, only three have never played in the Canadian Hockey League (CHL). The CHL is comprised of the three Canadian major junior leagues from which NHL teams usually draft their prospects: the Ontario Hockey League, the Western Hockey League, and the Quebec Major Junior Hockey League. According to Doug Hollinsky, the team’s director of hockey operations, the influx of major junior players in university hockey is likely to continue increasing across the country. Hollinsky handles player scouting and recruitment for the team, and believes that Ryerson’s newcomers have what it takes to make the Rams an elite team. Despite the plethora of new faces in the locker room, there isn’t much unfamiliarity. Many of the team’s athletes have played either with or against one another during their major junior careers, which has helped the group develop early- season chemistry. “The hockey world is pretty small, so you tend to get to know guys pretty quickly and if you don’t know them personally you kind of know of them,” said goaltender Charlie Graham, who joined the Rams from the OHL’s Sarnia Sting. Graham has started nine of Ryerson’s 13 games this season, splitting goaltending duties with second-year netminder Taylor Dupuis. It’s a stark contrast to the past five seasons, when Troy Passingham started 95 of Ryerson’s 139 total regular season games, including all 27 games in 2014- 2015. But as Duco points out, the team’s depth this season forces him to allocate ice-time carefully. That means that his players are constantly competing with each other, something Fine sees as a positive for their progression. While the Rams may be competing with one another for playing time, Duco says that even with the team philosophy he has aimed to implement, he’s surprised by how close the team has become in just half a season. Barring an epic second-half collapse, the Rams are all but guaranteed their sixth consecutive OUA playoff berth thanks to their strong start. Last year, the Rams beat Waterloo in two games to advance to the OUA West division semifinal, just the second divisional semifinal appearance in program history. The Rams marked their deepest OUA playoff run ever when they forced a third and deciding game in Guelph against the Gryphons, but Ryerson fell 11-3 to end the series and the season in heartbreaking fashion. This year’s Rams aren’t concerned with past shortcomings, and know that they have to stay focused on the second half of their regular season before turning their attention to playoff aspirations. As for Fine, he’s doing everything he can to take his team to new heights. He leads the Rams in goals (9) and points (18), and he’s on pace for the best season of his Ryerson career. 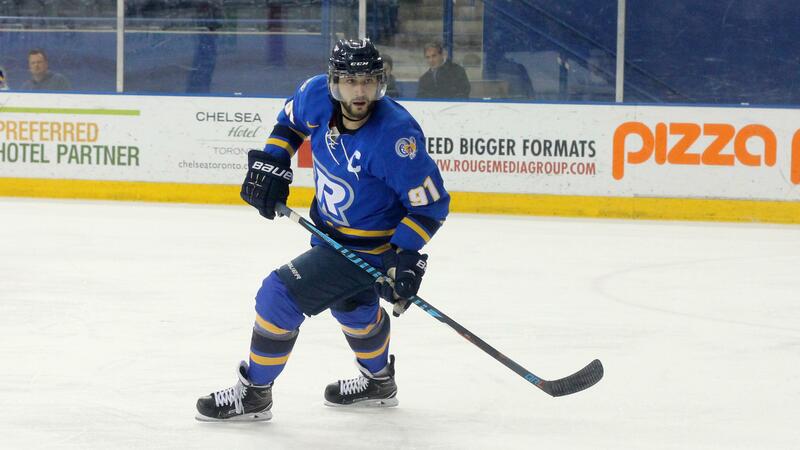 Fine currently ranks third on Ryerson’s all-time scoring list with 113 career points. He needs just two more points to move into second, and 19 to retire as the Rams’ all-time leading point-getter. It’s the last hurrah for the captain, and he’s making it clear to his teammates that the status quo won’t be good enough for these Rams.